Three single girls shared the same London flat. 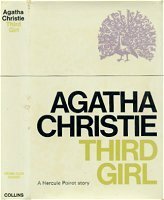 The first worked as a secretary; the second was an artist; the third, who came to Poirot for help, disappeared believing she was a murderer. Now there were rumours of revolvers, flick-knives and blood stains. But, without hard evidence, it would take all Poirot's tenacity to establish whether the third girl was guilty, innocent or insane.